There have been exactly 220 basketball games involving NEC teams this season prior to Christmas. There has been plenty to remember. There have been wins by the Fairleigh Dickinson men over AAC (Rutgers) and Big East (Seton Hall) members. Jason Brickman, who eventually became the conference’s all-time career assist leader, and LIU Brooklyn took Indiana to the brink. Glenn Braica’s St. Francis Brooklyn Terriers topped 2013 ACC champion Miami (FL) and nearly had an upset for the ages over Syracuse. On the women’s side, John Thurston’s Terriers have continued the program’s turnaround. SFBK is off to its best start (8-2) in four decades and their only two losses have come to members of major conferences. Meanwhile, Robert Morris’ Artemis Spanou extended her streak of consecutive double-double performances to 33 in a row, accounting for the second-longest span in NCAA Division I history. The notable accomplishments have been plentiful as have the superb plays. NEC Front Row has put together a collection of the season’s top plays to date. The piece divides the top plays from the 2013 non-conference season into four categories – Dominant Dunks, Attentive Assists, Terrific Threes and Buzzer Beaters. Joe Walton, Walt Hameline and the others knew they were starting something worthwhile back in the mid-1990s, but could they have imagined this? 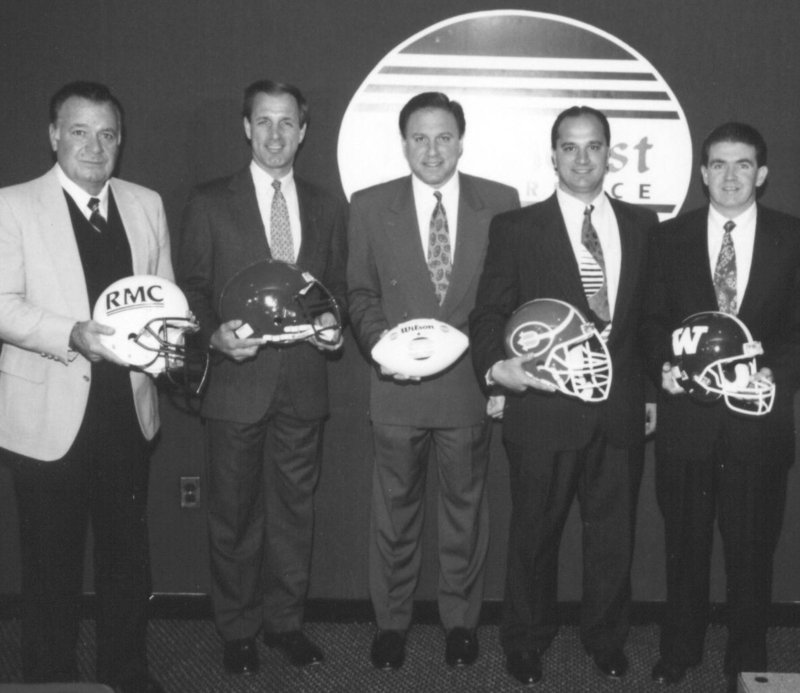 NEC football began as a five-team, non-scholarship league in 1996. More evidence of the NEC’s meteoric rise was on display when the Sports Network announced its 2013 Division I FCS All-America Teams. The NEC never had a Sports Network All-America selection until 2001 when former Wagner linebacker Daryn Plummer earned a spot on the Third Team. It wasn’t until 2006 that the NEC garnered more than one selection in the same season. Central Connecticut running back Justise Hairston (Second Team) and Robert Morris defensive end Ray Gensler (Third Team) were the culprits. Now, back to the present day when EIGHT (8) NEC student-athletes are celebrating Sports Network FCS All-America honors. “I can honestly say that we have high-quality, extremely-talented players in the NEC,” said Sacred Heart running back Keshaudas Spence. The 2013 NEC Offensive Player of the Year earned a place on the All-America Third Team. The NEC’s number of All-American selections as well as the league’s heavy presence on the national FCS statistical leader boards help justify Spence’s claim. At the conclusion of the regular season, three of the top-seven leading rushers in Division I FCS were Northeast Conference running backs. Spence, Saint Francis’ Kyle Harbridge and Central Connecticut’s Rob Hollomon all rushed for over 1,400 yards and earned All-America honors to boot. Duquesne linebacker Christian Kuntz, a Sports Network Third Team All-American, averaged 1.8 tackles for loss per game to lead the nation. “It is nice to see all of our hard work get noticed under a national scope,” said Harbridge, who was named a All-America Second Team running back. Harbridge’s 1,619 rushing yards (in only 11 games) were the third-most by a FCS back during the 2013 regular season. 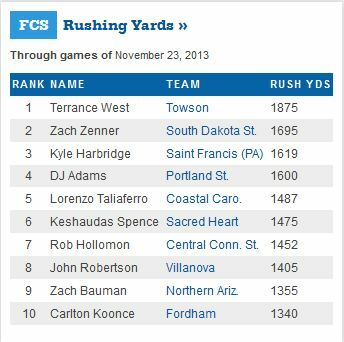 The Red Flash running back averaged the second-most all-purpose yards per game (188.2) on the FCS leader board. Only Hollomon, a Second Team selection at the all-purpose position, posted a greater average (189.2 ypg) amongst national leaders. Robert Morris cornerback Antwan Eddie was billed a Third Team All-American for his punt returning prowess. “Antwan [Eddie] is a top-10 play type of returner,” said Robert Morris left tackle AJ Dalton, who was one of the NEC’s four selections on the Sports Network All-America Second Team this season. Meanwhile, Eddie had some complimentary words for his fellow Colonial. According to Eddie, Dalton showed no shortage of leadership ability. “He always helped us keep a positive attitude – always,” the All-NEC cornerback/return specialist exclaimed. Dalton’s graduation will leave big shoes to fill on RMU’s offensive line, but the Colonials will have their All-American punt returner back for another season. In fact, six of the NEC’s eight All-America selections have at least one season of NCAA eligibility remaining. Harbridge and Dalton are the lone two who have exhausted their eligibility, and both men may get the opportunity to continue their careers at the next level. With top talent returning, NEC football could be in for more exciting days ahead. Certainly, the “founding fathers” have to smile about what the NEC has become. Joe Walton (far left) and Walt Hameline (far right) pose an the inaugural NEC Football press conference. In 2003, the first NEC football game was televised. Three years later, the NEC Presidents voted in favor of athletic grants-in-aid. In 2006, Central Connecticut and Albany became the first NEC teams to ever crack the National Top-25 rankings. Wins over programs such as Delaware, Georgia Southern and Lehigh gave FCS fans around the nation no choice, but to take notice of the Northeast Conference. It wasn’t until 2010, however, that the NEC acquired an automatic berth into the NCAA FCS playoffs. Silencing the folks who said the NEC didn’t belong, league champion Robert Morris went into the Fargo Dome and held a 7-6 over North Dakota State at halftime. Even though the Colonials didn’t escape with an upset for the ages, they made their point – they BELONGED. In 2012, Wagner became the first program to host an FCS playoff game. The Seahawks proceeded to post the NEC’s first0ever playoff victory by downing Patriot League champion Colgate, 31-20, on Grymes Hill. The 18th season of Northeast Conference football produced a number of prime plays, but, in the interest of saving time, the Overtime! Blog selected seven of them for your viewing pleasure. In conjunction with NEC Front Row, we are proud to bring you the NEC Football #Super7 – the Seven-Best Plays of the Season. After watching the 4-minute highlight reel, be sure to vote for your favorite play in the poll below. We will announce the voting results and name the Fans’ Choice for 2013 #NECFB Play of the Year on New Year’s Eve (December 31). Eddie’s first season as a punt returner was a pretty fruitful one. On his way to a RMU single-season record 405 punt return yards, the native Floridian took one 88 yards to the house in a Week 5 road win at Big South member VMI. The 88-yard touchdown is the longest punt return in Robert Morris annals. It was an “once-in-a-lifetime” play and it turned Sacred Heart receiver Moses Webb into a YouTube sensation. It also proved to be the winning score in a victory over FCS independent Monmouth and it never would have happened had it not been for Webb’s hustle. Showing that one should NEVER give up on a play, Webb made a reception over the middle, fumbled the football, chased down the defender who recovered the fumble, forced another fumble, scooped up a loose ball and ran 51 yards to paydirt. Harbridge produced the second-highest single-game rushing total in the FCS this season when he sliced and diced nationally-ranked Fordham for 291 yards on the ground. The Walter Payton Award candidate scored three touchdowns in a near-upset of the Rams. One of them was a 67-yard scamper out of the wildcat formation. With seven runs of 50 yards or more this season, we could have produced an all-Harbridge #Super7. Six of Williams’ 276 career points came on an improvisational hook-and-ladder play in Wagner’s Week 1 win over Patriot League member Georgetown. Like Williams’ career numbers, this touchdown was pretty. The fifth-leading rusher in NEC history, the New Jersey product finished his career with 4,435 yards on the ground. He ran for 1,127 yards in 2013, accounting for a third straight 1000-yard campaign. If he’s made one thing clear over the past two years, Hollomon is a threat to take it all the way every time he touches the football. He rushed for a NEC-best 18 touchdowns this season, including this 94-yard score against Salve Regina. Hollomon totaled 194 yards and three touchdowns on just eight first-half carries against Salve. He also had three TDs earlier in the season against nationally-ranked Lehigh. What a way to start the season! Brady made himself a trending topic on Twitter for the one-handed catch he pulled off during Duquesne’s Week 1 win over CAA member Albany. Not only did Brady look good making the grab, but he scored 6 points on the play to boot. ESPN went on to name the touchdown catch as the No. 3 College Football Play of Week 1. Talk about answering right back! After a 24-yard touchdown pass extended Sacred Heart’s lead to 28-14, DePadua got it right back for the Bulldogs. And, yes, the 100-yard kickoff return was the longest in the NEC this season. The Northeast Conference and its student-athletes accounted for a number of “firsts” during a 2013 fall season that has left behind plenty of noteworthy memories. ♦ The NEC kicked off the academic year by using the conference’s first-ever Google+ Hangout to preview the football season. ♦ In an even more impressive first-time feat, Saint Francis’ Tesa McKibben accomplished something that had never happened before in the history of Division I women’s soccer. ♦ NEC football placed four representatives – the most in league history — amongst the finalists for major Division I FCS honors. Earlier in the season, two of the conference’s gridiron warriors found out what it feels like to “go viral” in the realm of social media. ♦ The success of NEC cross country team champions Central Connecticut (men) and Sacred Heart (women) extended into the postseason as individuals from both programs went on to make waves at regional championship meets. ♦ In addition to hosting the second annual NEC Basketball Social Media Day, the Borough of Brooklyn was home to two championship teams this fall. Two “YouTube” stars were born this season as the efforts of two individuals forced NEC football into the national news. Duquesne’s Sean Brady was the first NEC receiver to “go viral.” Brady made a one-handed touchdown grab while falling to the turf in a Week 1 win over Albany. Once footage of the catch made its way onto YouTube, it was watched by approximately 100,000 people over a 48-hour period. Widely-followed Twitter accounts such as Bleacher Report tweeted about the amazing reception and ESPN went on to name it the No. 3 College Football Play of the Week. After Brady’s 15 minutes of fame faded, Sacred Heart’s Moses Webb put the NEC back into the spotlight. Helping Sacred Heart to a Week 10 win over Monmouth, Webb scored a touchdown the unconventional way. After making a catch over the middle, Webb fumbled the ball away to the opponent and the fun began. Quickly recovering from his miscue, Webb chased down the ball carrier and forced another fumble while making the tackle. The SHU receiver proceeded to recover that fumble and take it 51 yards for a score. The hustle play appeared on a number of national networks including ESPN and NBC Sports Network. 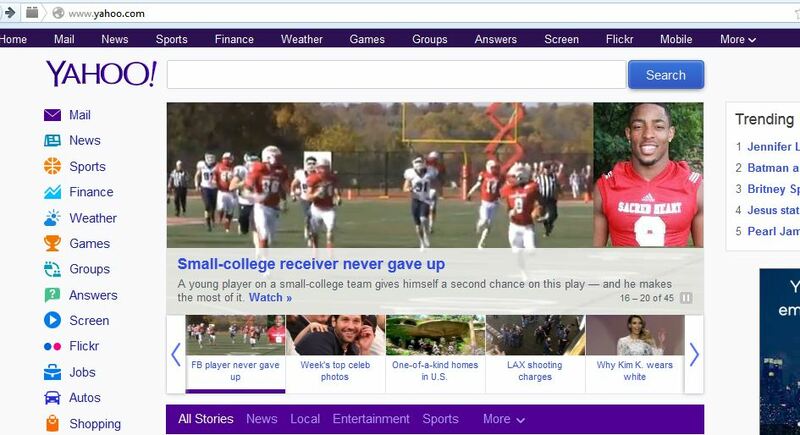 FoxSports.com, Bleacher Report and a number of other online media outlets posted articles about Webb’s tremendous effort. The story even made the front page of Yahoo.com. NOTE: The YouTube video of Webb’s touchdown has garnered over 2.25 million views.